Soft ground etchings; both fine impressions pulled on quite thick ivory wove paper. a) Printed in red brown ink, signed and dated on the plate S. P. 1908; 220 x 160 mm, the sheet 230 x 175 mm. 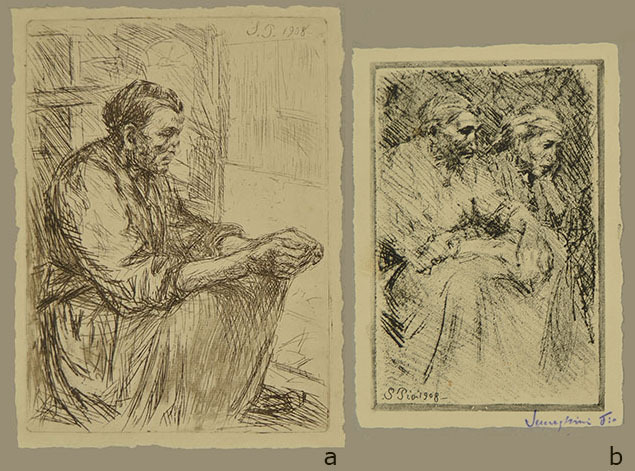 b) Printed in black ink, signed and dated on the plate S. Pio 1908 signed with violet chalk at bottom right margin Semeghini Pio; 185 x 125 mm, the sheet 203 x 140 mm. 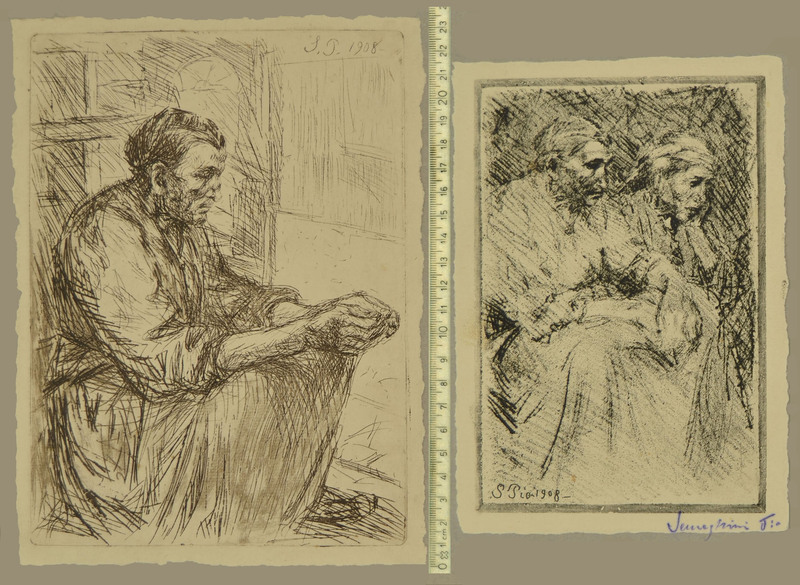 Two rare etchings of Semeghini's Parisian period. See Pio Semeghini, L'opera grafica, exhibition catalogue, Campione d'Italia, 1975, nos. 28 and 30. Semeghini often travelled to Paris, between 1899 and 1914; there he was influenced by the works of Cézanne, Renoir, Gauguin and Van Gogh. In 1912 he worked, at Burano, with Moggioli, Rossi, Scopinich, Arturo Martini and Garbari (the 'Burano School'). In 1919 Semeghini exhibited at Cà Pesaro, enjoing his first success. In 1927 he joined the group Il Selvaggio with Soffici, Carrà, Lega, Rosai, Morandi. He exhibited at the Venice Biennale in 1926, 1927, 1932, 1934, 1936.